How can we move from observation to co-creation? Or, from observer to co-conspirator and change agent? This post shares part of a project design that took that journey. It was Friday in Tokyo. We had been there just six days and this was the second country in thirteen. It was Friday, almost 1:00pm and the Co-creation Workshop with 18 young mums, our clients (8 attending) translators (4) and ourselves (3) was ab out to begin. We were in a large room. A part had been screened off earlier for “baby care”. The majority of the room was filled with three large stations (large round tables and rolling whiteboards and a large U for 18 people with whiteboard and instructions up the front. Planning: We’d planned the Co-creation Workshop to follow a series of days immersed in-home. We ran a prototype workshop that morning with the local moderation team and translators. After four hours they remained skeptical and not 100% confident about the instructions. We apparently were about to break a lot of “rules”, and anyone who’s done research in Japan must know how hard that may be! They were not completely happy, although quite curious; we had already earned their trust by behaving appropriately, at the in-home immersions. Each table was filled with creative materials, pens scissors, glue, magazines etc. After some deliberation, we agreed I’d give the warm-up instruction through a translator, and then continue to do the same for the rest of the workshop. Expect the Unexpected: The noise was now deafening in the room. As each Mum arrived and left her baby with the caretakers they started screaming. It clearly wasn’t workable. We asked for another room for the children. At first this was impossible. Not in the contract, not signed by the Mums and more. In the end it was sorted out and the room became silent. The Mums assembled and sat down in the large U.
Kick-off: We explained what we were doing, why they were here and who we all were. Each of us had met some of them at their homes. We said they would be working with each other for the afternoon and we’d like to help them with an introduction. 18 people can take a long time. Our partners had baulked at the next step. I was to ask them all to close their eyes to introduce a reflective thinking exercise. They also all had a large marker and oversized post-it in front of them. With the help of my translator I explained why closing their eyes was important. It is a foreign thing …. please try it. 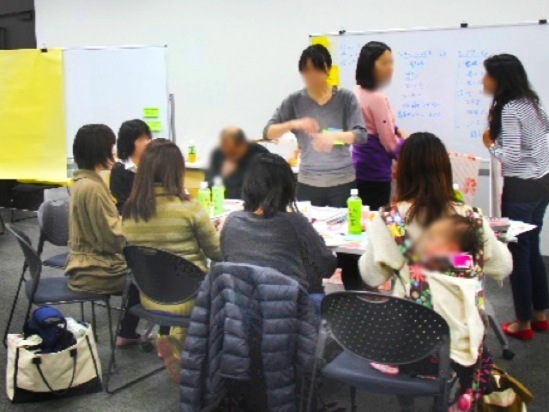 I narrated the reflective period slowly for them through the translator…then after a few moments asked them to open their eyes and draw a picture. Now the hard part…. Getting them to come up and overcome their reserve to introduce themselves to each other and to a broader team than the one they had met in-home. However I knew they had one thing in common and they were a little curious. Baby stories - that’s what I’d asked for. I clowned out my own and then asked them (without order) to come forward one by one when ready. There was a very long silent pause (I prayed really hard)…. Finally one came forward, Hello, my name is… my picture’s story is…. immediate clapping! Each came forward one hurdle down. Great about 15 minutes! We then moved on to a mind-mapping exercise all standing together up front. It was starting to be fun and “very different”. They could see we wanted all their ideas. And, we quickly learned, they wanted to share them. At this point you may wonder what a Co-creation Workshop has to do with Ethnography. We wanted help turning our observations, our understanding into real breakthrough insights. This was our testing time, our time to prototype ideas and gauge responses. Tease out conceptual nuances and check language. Workshop: We broke them into three table groups loosely organized into similar behavior types and loose personas (as observed in-home and through their interviews). Client team and translators split to the three tables and their own large boards. Each team started building some collages. So neatly cutting pages out of magazines. Then discussing where they fit. This was followed by two more tasks each one taking approximately 45 minutes. When the 5:00 time came they were still busy! They didn’t want to leave. The Babycare service came in and said…. “come get your babies”. Interestingly not one Mum had been out to check on their baby for four hours! A few Mums left as newfound friends. Debrief: We sat down together as a group moving from table to table each team briefing out what they had heard, a live recap and commentary of what had gone on. This was all captured on video. By 7:30 we had key findings and conclusions summarized. We also had some real breakthroughs’ in understanding. There were a few sighs and most of us were exhausted as we headed to hotels and planes. Is co-creation part of your projects? When and how can you bring it in to yours? This all started when asked to take a client team to Japan as part of a multi-country learning journey incorporating immersive ethnographic inquiry. Our global client had never before had access to homes in Japan. Their traditional research company said it wasn’t possible and they had been effectively limited to focus groups. We found this a little hard to believe and so we set ourselves two big goals. Get into homes and ask the same respondents to come and work with us in creative co-creation session. Benefits Start Early: We were confident in our process and approach. Yet Japan taught us lessons we will never forget. We are used to working in an agile way. This was simply “foreign” at times. As ethnographers, we seldom get the luxury of hours and hours of observation. We have to find ways to fill in the gaps. While we’d like to go longitudinally we can seldom do that in person. So the diary, scrapbook, mobile, online elements often help to start filling in the gaps. They confirm the participant will open up and it is surprising how many find that initial set of tasks therapeutic. Each step of the way we establish trust and share our empathy and curiosity with them. Like anyone when you have talked and shared they get somewhat talked out. Yet over time, they become much more interested topic / product/ problem. Then having 18 or 24 respondents into a workshop (like the one above) gets their collective intelligence working for you. How did it start? We partnered with an agency that we had worked for before. We’d already shared some of our ways with them. Now they’d help us do it in their country. Our project was to study young mothers in-home. Our clients on this learning journey were a global group. While some had been to Japan before none had done in-home immersions. Up front we also knew that “translators” would play a key role as the difference is often in the nuances. Although at our initial meeting we had our concerns. There are strict guidelines on simultaneous translation and they typically run a stopwatch before switching out to stay “fresh”. Right at the beginning we were convincing them that we needed to go in-home and they may need to translate for two hours straight! We also had to discuss video and photography. Privacy laws are strict in Japan for using anyone’s image. (This put some restrictions on uploads – this is legal requirement.). At our first pre-planning and briefing soon after arrival we met our three moderators and one translator to help us with the briefing. We thought all understood what we wanted. We had an early look at whom we’d be visiting with the next day. Three teams were going out (a total of six interviews per day) each one with moderator, translator, one of our team and two or three client reps. A relatively large group that a week earlier had been doing similar work in India. We decided we needed a briefing with the translators the next morning before heading out. First Day Out: On the trains we read respondent’s scrapbooks (translated) they’d been done by all as PPT’s. It was a great backgrounder to their lives, likely some of what we’d see and an anchor for some of the conversation to come. As we entered their homes, we slipped off shoes, and typically found our place sitting on the floor. The homes were clean sometimes cluttered with toys, and we found many of these women were quite isolated. They easily shared the story of their world. Concurrently we kept pushing for a little more depth… Why? Tell me more? We pushed the moderation team to go deeper in areas. Culturally this was often hard for them. They too grew in confidence helping us ladder down or up on different concepts and deepening our understanding. It was also a great example of “foreigners “ being an excuse to experiment. Before long the translators also knew we were looking for real nuances and didn’t want any of them lost in translation. As part of the project respondents were committing to come to a Co-creation Workshop at the end of the week. By the end of each in-home we’d seen and understood much about their lives, their dreams and aspirations. They’d seen our curiosity and our belief that what we could learn from them could make a difference. All eighteen respondents that we visited turned up on Friday for the four-hour Co-creation workshop. Some had an hour or more travel each way! For them it was an adventure. For us it wrapped up the week. This worked in India, Russia and Japan and has been done elsewhere too. Reflections: We often think about a project or journey like this as a combination of investigation and story. When we have everyone in a Co-creation session we also consider the staging, the artifacts and then ask how will it help us sustain energy or help us all brief out later. Take time: There real benefits were in establishing a deep understanding of context and enabling the conversation time to review and reflect. This benefits everyone. Multiple teams came back with different stories each day. Each one had something fun, some new insight. There are real benefits in the re-telling, the write-ups and then following day reflections. Think Agile: With all the teams we work with the ones that are working with software are the most agile. Many times we find them filing bug reports in real-time while spending every moment capturing user stories. That also goes for revamping guides daily and raising the bar with each inquiry. Have the Right People: An easy point to write however often groups aren’t cross-functional enough. This helps later when it comes to sharing findings and deciding how to take the stories back home. These are things that an “outsider” to a company may guess at. For us the purpose of great research and insights is to secure change. Spend Time Planning: There are many details missing from the above. From the focal issue and pre-planning workshop, through the blography aspects, client workshops, the final report and the impact it had on the organization. We’d stress the need to both customize by project / team/ situation and be ready to change the model in hours if it isn’t working. We were all proud of this project. It worked in the field, it worked with respondents and our Client learning journey team will never be quite the same after it. Stuart Henshall (San Francisco) and Dina Mehta (Mumbai) are principals at Convo, a research and strategy firm they co-founded. Stuart as strategist and facilitator believes in agile co-creation methods to accelerate learning. Dina leads the ethnography practice with a background in sociology and anthropology. They are evangelists for new ideas and practices.